At last the time has come to bring this long standing ambition of mine into fruition….a BIG SING! The first ever West Cork BIG SING! 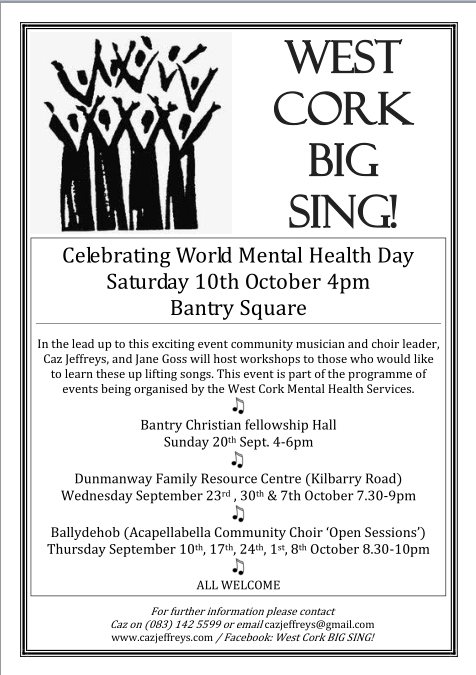 is being organised in Bantry Square to mark World Mental Health Day on Saturday 10th October at 4pm. The BIG SING! initiative will be launched as part of a programme of events being organised for 8th, 9th and 10th October. Together with the support of local groups such as: Co Action, the National Learning Network and the West Cork Mental Health Services, we aim to attract as many people to participate as we can. In the run up to this exciting project there will be a number of opportunities for those who would like to learn the songs in advance, and people are also encouraged to simply turn up on the day to join in. We would like to involve people from as many areas within West Cork as possible. One way to help spread the songs is through the involvement of local choirs and singing groups but we also hope to encourage the wider public to bring forward their voices and join us. It is hoped that the West Cork BIG SING! will continue to grow and roam around the communities of West Cork, spreading it’s positive message of support to those suffering the effects of mental health issues at many different events throughout the years. 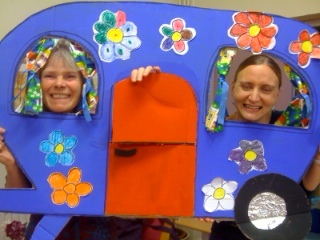 Please join and share our events page on facebook: West Cork BIG SING!